Description: Our Magic Titanium Curling Iron reaches up to 240'C (460'F) degree and it actually shows you the temperature through Digital Read Out System. It even keeps you safe from danger for 10 minutes automatic ----- shut off system. Beyond The Beauty 25mm (1") ceramic cone clamp less curling iron for consistent heating. Innovative clip less design for professional results, won’t leave crimp line. Beyond The Beauty curling irons use Negative Ion Technology that gently heats hair from inside out. Easy glide barrel for smooth tangle free curling that will leave your hair healthier and shinier and not burned, damaged or over dried. Dual voltage 110v-240v so you can use it all over the world! Innovative clip less design for professional results, won't leave crimp line. 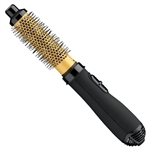 Easy glide barrel for smooth tangle free curling, hair not burned, damaged or over dried. Makes your hair shinier and healthier. The Chromatique 3 in 1 Curler 19/9mm, 25/19mm, 25/25 Curling Iron give you a full and natural look that cannot be duplicated with any other brand. This is the most versatile curling iron the market today. It’s the only ironin the industry that can create numerous looks with a patented cone shapedbarrel. Looks ranging from tight ringlet spirals, to large curls, and waves thatcan all be created with just one iron! 1. Place glove on the hand in which you hold the hair. 2. Select a small even strand of hair to place in a curl. 3. Place the base of the curling iron handle near the scalp of your head withtip facing down. 4. Wrap the hair from the base of the curling iron to the tip in a downwarddirection. 5. Hold for 2 to 5 seconds. 6. Without pulling the curling iron down, release the hair from tip allowing thehair to slide out. 7. Slide the curling iron out of the hair. DO NOT pull it down; it will make thecurl tangle. Professional all-in-one tool with ceramic heating technology.